Since the 16th century Catholic piety has assigned entire months to special devotions. 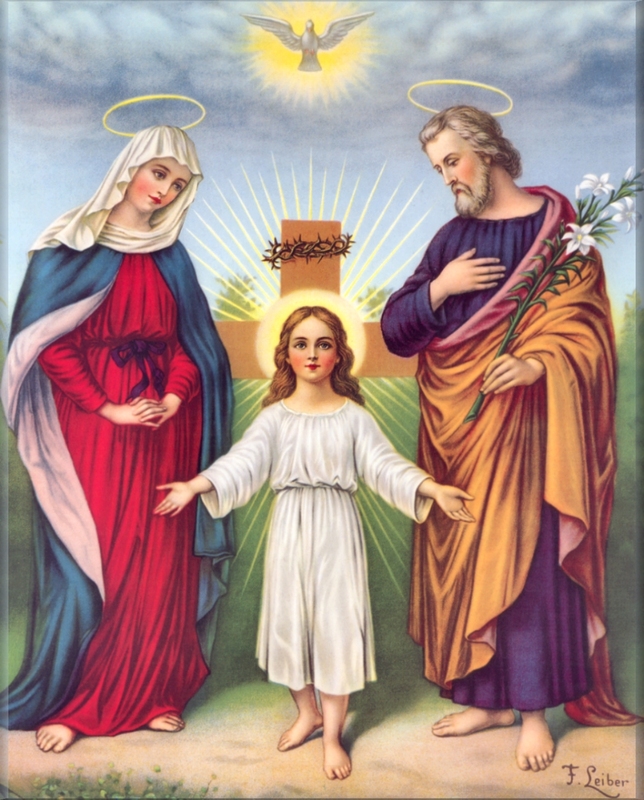 The month of February has been primarily asociated with the Holy Family, probably due to the feast of Our Lord’s presentation at the temple, celebrated on February 2. At the very outset of Christ’s work on earth, God showed the world a family in which, as Pope Leo XIII teaches, “all men might behold a perfect model of domestic life, and of all virtue and holiness.” The harmony, unity, and holiness which characterized this holy Family make it the model for all Christian families. Jesus, Mary, and Joseph most kind, Bless us now and in death’s agony. Grant unto us, Lord Jesus, ever to follow the example of Thy holy Family, that in the hour of our death Thy glorious Virgin Mother together with blessed Joseph may come to meet us and we may be worthily received by Thee into everlasting dwellings: who livest and reignest world without end. Amen. O Jesus, our most loving Redeemer, who having come to enlighten the world with Thy teaching and example, didst will to pass the greater part of Thy life in humility and subjection to Mary and Joseph in the poor home of Nazareth, thus sanctifying the Family that was to be an example for all Christian families, graciously receive our family as it dedicates and consecrates itself to Thee this day. Do Thou defend us, guard us and establish amongst us Thy holy fear, true peace, and concord in Christian love: in order that, by conforming ourselves to the divine pattern of Thy family, we may be able, all of us without exception, to attain to eternal happiness. Mary, dear Mother of Jesus and Mother of us, by thy kindly intercession make this our humble offering acceptable in the sight of Jesus, and obtain for us His graces and blessings. O Saint Joseph, most holy guardian of Jesus and Mary, assist us by thy prayers in all our spiritual and temporal necessities; that so we may be enabled to praise our divine Savior Jesus, together with Mary and thee, for all eternity. Our Father, Hail Mary and Glory be, three times. O God, heavenly Father, it was part of Thine eternal decree that Thine only-begotten Son, Jesus Christ, the Savior of the human race, should form a holy family with Mary, His blessed mother, and His foster father, Saint Joseph. In Nazareth home life was sanctified, and a perfect example was given to every Christian family. Grant, we beseech Thee, that we may fully comprehend and faithfully imitate the virtues of the Holy Family so that we may be united with them one day in their heavenly glory. Through the same Christ our Lord. Amen. Jesus, Mary, and Joseph, I give you my heart. Jesus, Mary, and Joseph, be with me in my last hour. Blessed be St. Joseph, her most chaste spouse. Amen. Say 3 Our Father’s, 3 Hail Mary’s, and 3 Glory be’s. GOD our Heavenly Father, You call all peoples to be united as one family in worshipping You as the one and true God. You willed that Your Son become man, giving Him a virgin mother and a foster father to form the Holy Family of Nazareth. WE pray: may the Holy Family of Jesus, Mary and Joseph, image and model of every human family unit walk in the spirit of Nazareth and grow in the understanding of its particular mission in society and the Church. May our families be living cells of love, faithfulness and unity, thus reflecting God’s covenant with humanity and Christ’s redeeming love for His Church. JESUS, Mary and Joseph protect our families from all evil; keep us, who are away from home, one in love with our dear ones. Jesus, Son of God, Son of Man, and Son of Mary, I thank you for the gift of life you have entrusted to my care. Help me be a parent both tender and wise, both loving and forgiving. Mary, Holy Mother of our Lord and Savior Jesus Christ, and our Motherly Queen of Heaven, nourish our family with your heavenly grace. Help us to remain faithful to The Most Holy Trinity, in all our sorrows and joys. Joseph, Earthly father to our Lord God, guardian and spouse of Mary, keep our family safe from harm. Help us in all times of discouragement or anxiety. Holy Family of Nazareth, help our family to walk in your footsteps. May we be peace-loving and peace-giving.